The Aerospatiale / BAC Concorde is a four-engine supersonic airliner with a capacity of maximum 128 passengers. The Concorde was jointly developed by Aerospatiale (France) and British Aircraft Corporation (United Kingdom). 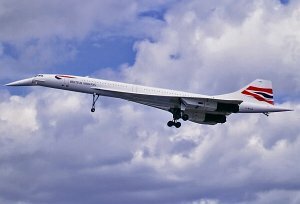 The Concorde was the world's second supersonic airliner after the Tupolev Tu-144. The first flight was two month after the Tu-144. The Concore was only operated by Air France and British Airways only.